Spring. My absolute favorite time of the year! It’s the promise of greater warmth, more light and new life. Not only do the flora evolve into their brilliant colors, scents and shapes, but fauna emerge with cute little babies being born. It’s a time of rebirth—both in nature and in ourselves. If you live in the Northeast, you’ll agree that it doesn’t look like Spring has sprung in the slightest; however, after discussing “forest breathing” and rejuvenating in nature with two clients this morning, I decided that my girls and I were going to get our outdoor fill after school. I took them to a park in town; not the manufactured playground kind, but the one filled with glorious tall trees which my 9-year old described as “pretty” in her writing afterwards. This place is quaint with a creek running through it, spanning only a few acres. It’s more like a spacious rural backyard, yet allows some nature lovin’ in suburbia. After groans about going, and it being cold, I had to practically beg my girls to leave this mini mecca as the sun was sinking beneath the horizon. I was suddenly the hungry one with numb toes. Belle sought out the perfect walking sticks for each of us, balanced along fallen tree trunks and played “drums” on hollowed pieces of wood. 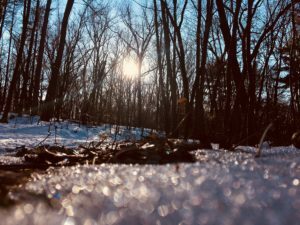 Rosey broke apart the ice with her walking stick, took photos, including the one featured in this post, and carved “Live Your Best Life” on a tree trunk. It ended as a delightful outing. Around this time of year, I usually take my girls on a hunt for “signs of spring”. Honestly, there were virtually none today, except for a few tiny buds on the tip tops of trees. It’s ok, for it was technically still winter for one more day. I can’t wait to see much more bursting and blooming! Spring is where it’s at. The word literally means to move or jump forward. Even though January has come and gone with New Year’s resolutions, here’s a first quarterly opportunity to continue on with our intentions, or start fresh. Refresh. In full grown thickness every May. Which is your favorite season? How does it speak to you? PS—If you would like to enjoy a book from a tree’s perspective, read Katherine Applegate’s Wish Tree. It’s an unforgettable book for the entire family.